Maximized maneuverability, drivability, operability, and serviceability. In the market for a mid- or rear-mounted tower? Take a look at the new Pierce Ascendant 100' Heavy-Duty Aerial Tower with its market disrupting maneuverability, drivability, operability, and serviceability. Reaching heights of 100' vertically and 93' horizontally, the Ascendant 100' Aerial Tower packages a 5-section heavy-duty steel tower onto a vehicle with a low overall height of 10'8" and length of only 41’3” with a rear overhang of a rear-mount that minimizes tail-swing, it offers superior maneuverability and greater visibility. The Ascendant 100' Aerial Tower is available on a variety of custom chassis and body styles to meet your department’s needs. Its integrated ground pads eliminate time spent throwing ground pads, so setup is streamlined and faster than any other aerial on the market. Configured as shown with a rear axle rating of only 48,000 lb, it outperforms with a 1,000 lb tip load capacity, up to 20-degree below grade operation, and a below grade 50-degree scrub area. All of this is accomplished at a mere 20' set-back from the building. Flow Capacity 2,000 gpm Hosebed Capacity 800' of 5"
Concern of crushing the bucket on corner mounted street poles is eliminated with the Ascendant 100’ Aerial Tower. There is no bucket hanging ahead of the cab blocking the view. The Ascendant 100’ Aerial Tower is smaller, shorter, lighter and more maneuverable. The lower center of gravity makes the vehicle feel more stable and easier to drive. At a mere 20’ set-back from the building, the Ascendant 100’ Aerial Tower can operate without sacrificing scrub area. The cab can be easily titled for normal engine compartment service with no obstruction presented by the aerial device. The compact 5-section, heavy-duty 100K psi high-strength ladder enables easier operation in confined space requirements at the fire scene. The T-shaped handrails provide an easier gripping surface to climb with a gloved hand. basket from the ground at full retraction to allow work to be done in tight spaces. 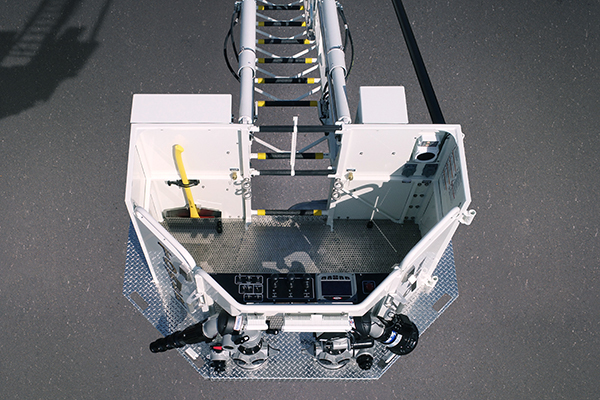 The Ascendant Aerial Tower has an impressive below grade range of up to -20 degree below ground level. With the turntable positioned higher behind the cab, it increases visibility down the entire ladder while stowed and deployed. Flow more water with greater knock-down power. The dual monitors are capable of flowing water at the rate of up to 2,000 gpm. The monitor can have unlimited horizontal nozzle sweep and vertical nozzle sweep of 45° above horizontal. The ground pads are permanently attached to each of the 6 stabilizer footpads. This shortens setup time by eliminating the need to manually place ground pads, promotes safety, assuring that the ground pads are used during operation, and provides stability during aerial operation. The low travel height helps reduce concerns with low overpasses and overhanging branches in residential areas and can allow for the apparatus to fit in smaller station bay doors. The Ascendant is designed to be operated on either an uphill or downhill slope while meeting all NFPA stability requirements. The 2 front downriggers, 2 rear downriggers and a single set of H-style stabilizers allow greater setup capability on uneven surfaces and sloped terrains, in addition to continuous side-to-side aerial sweep in below grade operation. Short-jack in congested areas with a mere 13’ stabilizer spread. With a 2,500 lb equipment allowance, 800’ of 5” hose storage in the hosebed, and a minimum of 170’ ground ladder storage, ample storing options are available to meet your department needs. Mid-mount aerial towers are generally easier to spot and position on the fire ground. With the turntable positioned behind the cab, it is easier for the driver to align the center of the turntable with a point on the building when approaching and setting up at the fire scene. This also allows for closer positioning of support vehicles on the fire ground. Designed using 100K psi high-strength steel, the 4-person, 1,000 lb dry tip load, ergonomic basket has chamfered front corners, dual monitors, and is easily accessible from the ground.